The Heritage Library Hendrik Conscience in Antwerp received a rare 17th-century handwritten cookbook as a gift from her friends association. On the website of the Heritage Library you can find the digital version of the book in pdf format. Cookbooks from that period are extremely rare. From the seventeenth century only a dozen culinary manuscripts have survived in the Dutch language, together with only two printed cookbooks. That’s because cookbooks are used daily. They were not kept in the library but in the kitchen, to be consulted every day until they fell apart and were discarded. fols 1-36v: Cookbook in the same hand (first hand) with a hundred recipes. 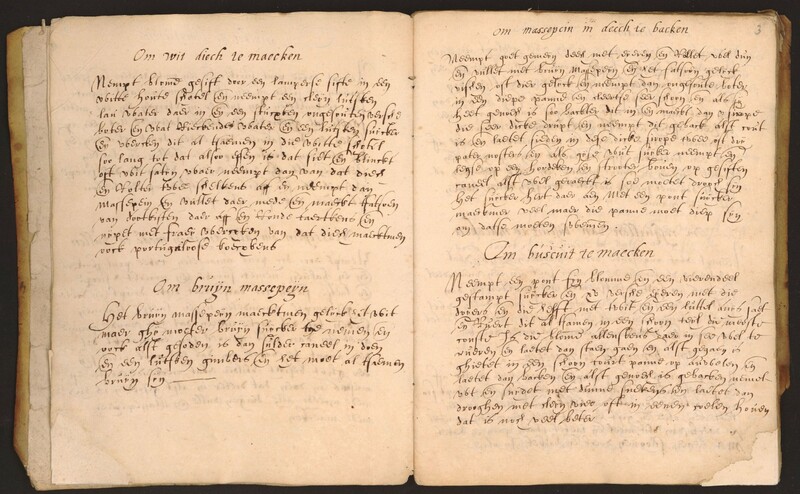 fols 37r-42v: Medical recipes, mostly in Dutch, some in French. 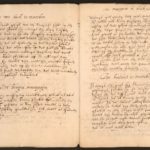 fols 50r: Three cooking recipes in Dutch (Brabants). fol 51r-56: Letters in French by a woman (second, possibly third hand) to her mother and sister stating “le cloistre de Muizen”, “ducasse” and “la ducasse d’Anvers”. Possibly these are letters from a girl from Antwerp in a boarding school in Brussels. We modernized a waffle recipe from the manuscript for the newsletter of the Friends of the Heritage Library. We will publish this recipe and its modern interpretation shortly on this web site. Click here for the description in the online catalog of the Heritage Library. Click here for an electronic version (PDF) of the cookbook. Neerslag van een handgeschreven kookboek uit de 16e eeuw. !